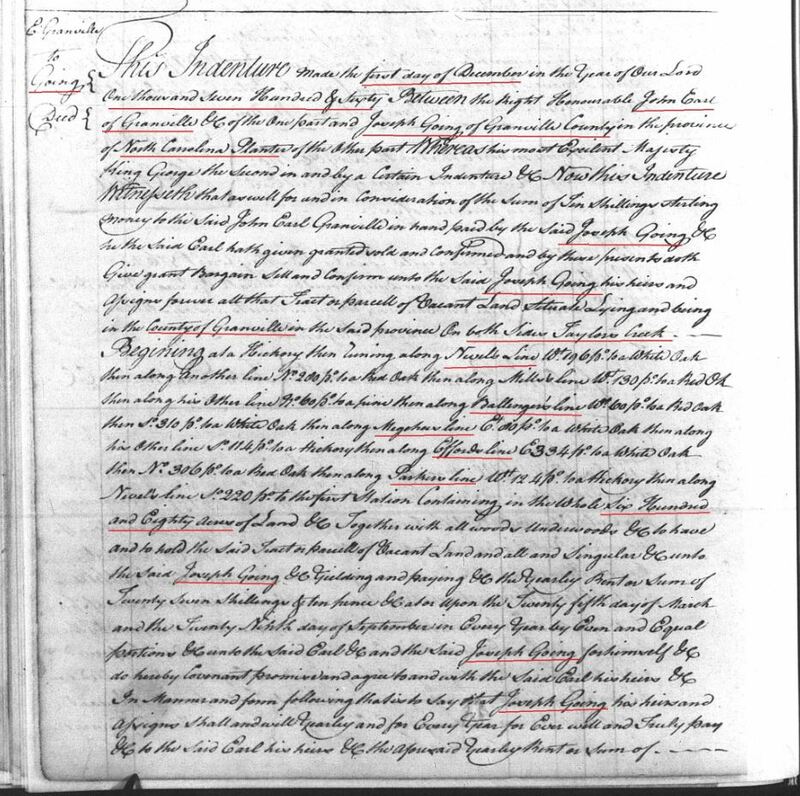 1753 Sept 5 – Ann Gowen, was living in Granville County September 5, 1753 when the Granville County Court ordered her “mulattoe child, Cooper” be bound to John Parnall. 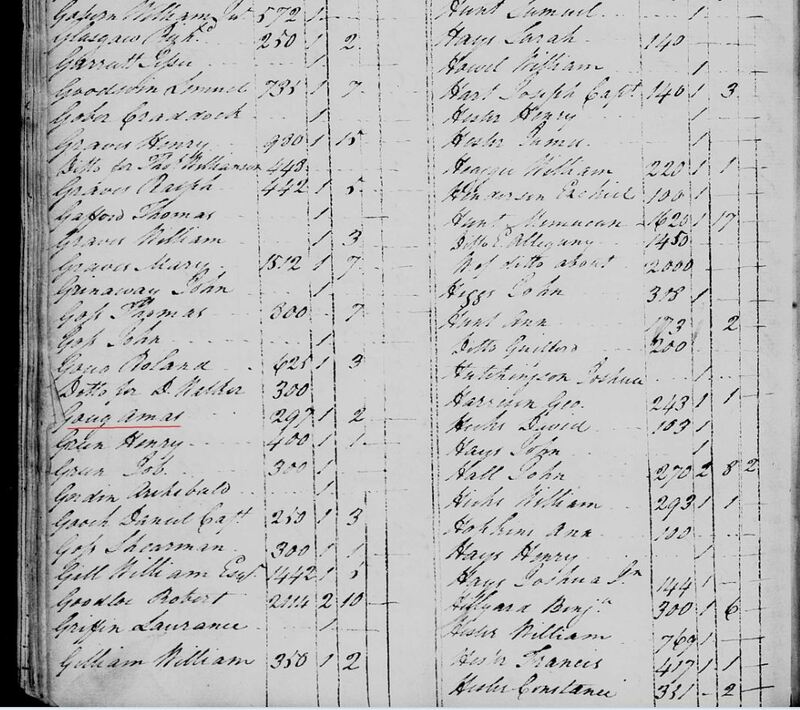 1754 Oct 8 – Joseph Gowen – North Carolina Militia – Muster Roll of the Regiment of Col William Eaton, Granville County, NC. 1754 Oct 29 – Title: Yancey, James. 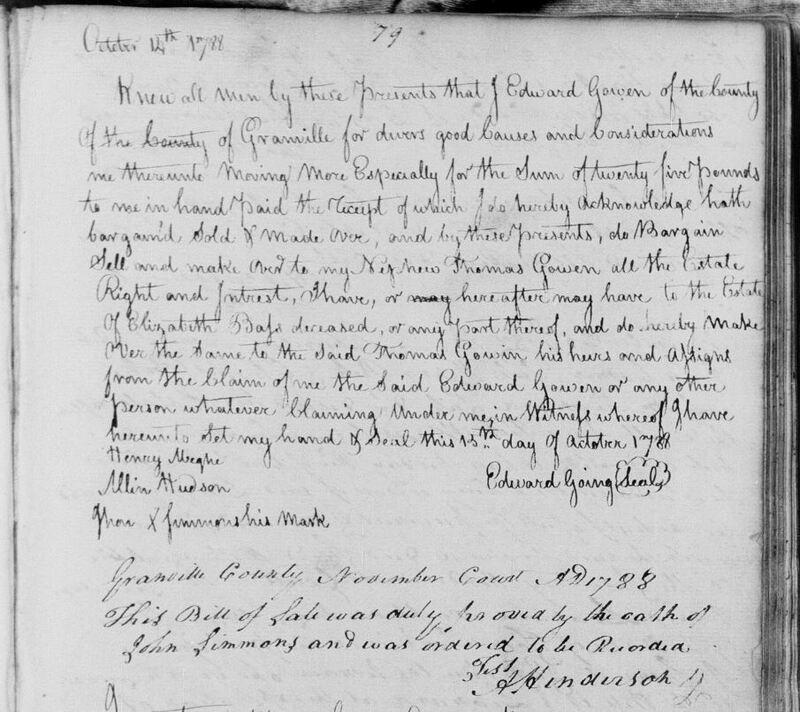 Granville Co. Provenance: Class: State Records [Collection], Group: Secretary of State Record Group; Series: Granville Proprietary Land Office: Land Entries, Warrants, and Plats of Survey; Box: Granville County, Wh-Z; Years: 1754, 1755, 1760; Creator: Secretary of State, Office of Granville Proprietary Land OfficeSecretary, Office of the; Call Number: S.108.270—S.108.283; Location: MFR; MARS Id: 12.12.40.66 (Folder); Genres / Forms: Warrants, Warrants, Plats, Deeds; Scope / Contents: Warrant: 1754 October 29. 640 acres. Descriptive references for land: Jonathan Creek Warrant: 1754 October 29. 640 acres. Descriptive references for land: Jonathan Creek Plat: 1755 February 14. 618 acres. Descriptive references for land: Jonathan Creek; Chain carriers: John Gowing, Bartlet Yancey. Surveyor: Sherwood Haywood Deed: 1760 March 14. Note: The first warrant (no. 321) is marked “Now Land to be found.” For deed see 12.13.61.16. Granville Co, NC. 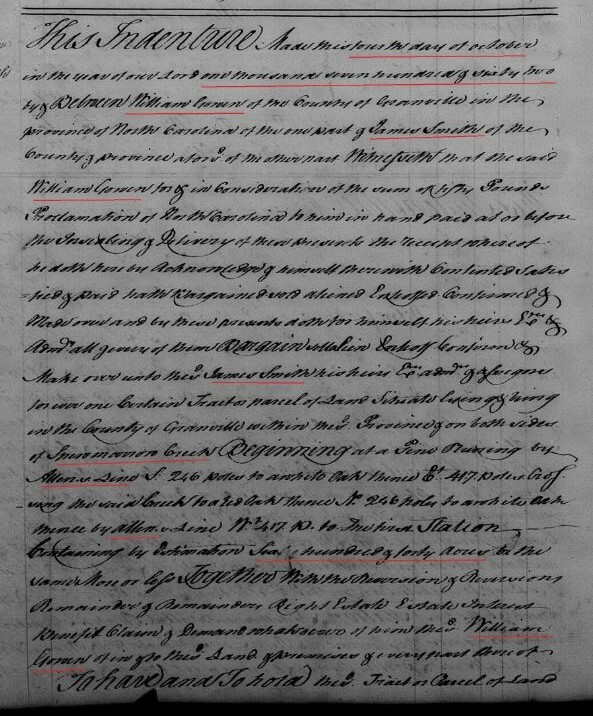 1755 March 4 – William Eaton Jr and Co v. William Going – In the action of trespass on the case between William Eaton Junr and Co and William Going Deft a jury being elected tryed and sworn well and truly to enquire of the damages upon their oath do say that they find for the Plt forty three shillings and eleven pence sterl damages. Wherefore it is considered by the Court that the Plt recover agt the Deft the damages aforesd in form aforesd assessed with costs. 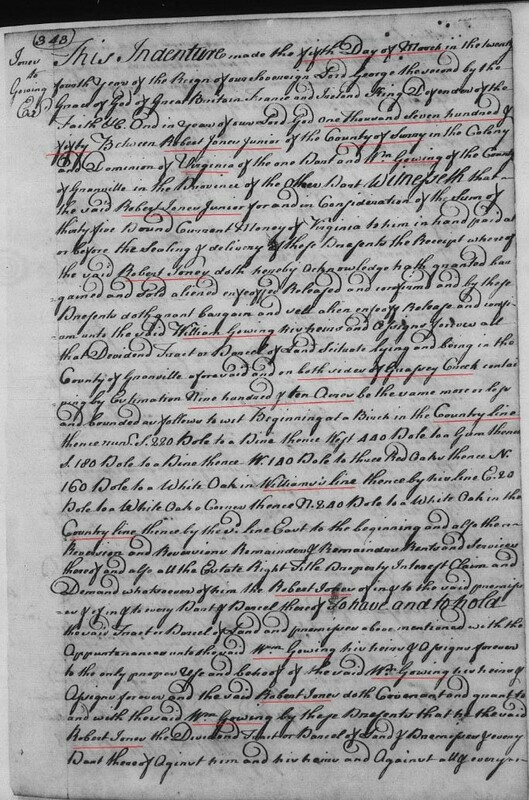 Minutes 1754-1764. pg 17 Granville Co, NC. 1755 June – Thomas Parker v Michael Gowen Jr – In the action of tresspass on the case between Thomas Parker Plt and Michael Gowen Junr Deft a jury being elected tried and sworn the truth to speak upon the issues joyn’d upon their oath do say that the Deft did assume in manner and form as the Plt agt him hath declared and they do assess the Plt damages by occasion of the nonperformance thereof to forty shillings Virg money. Wherefore it is considered by the Court that the Plt recover agt the Deft the damages afsd in form afsd assessed with costs. 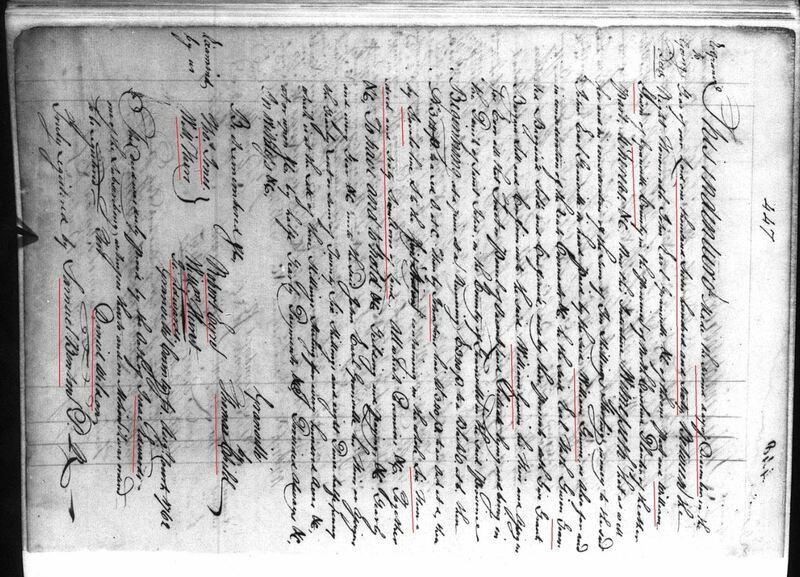 Minutes 1754-1764. pg 25 Granville Co, NC. 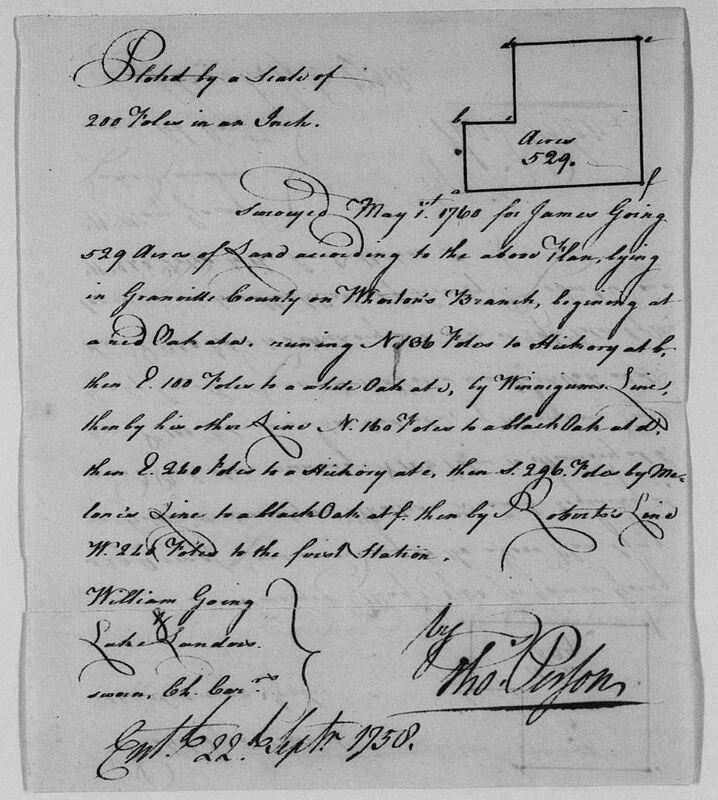 1757 June 7 – In the action of debt between Robert Parker Plt and Edward Gowen Deft a jury being elected tried and sworn the truth to speak upon the issue joind upon their oath do say that the Deft doth not owe in manner and form as the Plt agt him hath declared wherefore it is considered by the Court that the Plt take nothing by his bill but for his false clamour be in mercy and that the Deft go home without delay and that he recover agt the Plt his costs by him about his defence in this behalf expended. 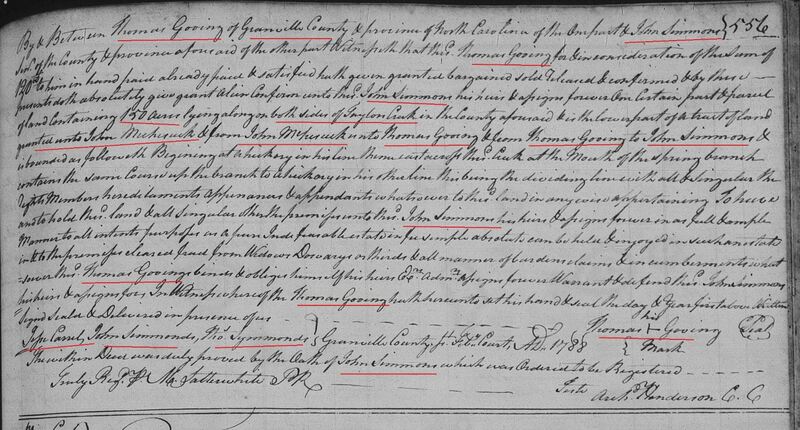 Minutes 1754-1764. pg 44 Granville Co, NC. 1757 Sept 6 – Charles Turnbull v. William Gowen – In the action of Trespass on the case between Charles Turnbull Plt and William Gowen Deft a jury being elected tried and sworn well and truly to enquire of the damages upon their oath do say that they find for the Plt fourteen pounds three shillings and a penny sterl damages. Wherefore it is considered by this Court that the Plt recover agt the Deft the damages afsd in form afsd wth Costs. 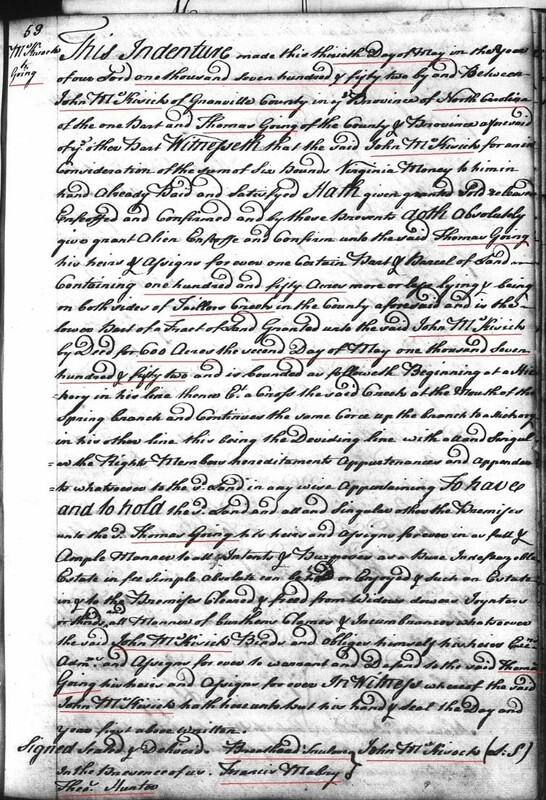 Minutes 1754-1764. pg 43 Granville Co, NC. 1757 Sept 6 – James Boyd v William Gowen – In the action of Trespass between James Boyd Plt and William Gowen Deft, Andrew Hampton and Jatude Yancey the arbitrators formerly appointed by consent of the parties now present their report via this award that the Deft shall pay unto the Plt fifteen shillings proct money. Wherefore it is considered by this Court that the Plt recover agt the Deft the said sum with costs. 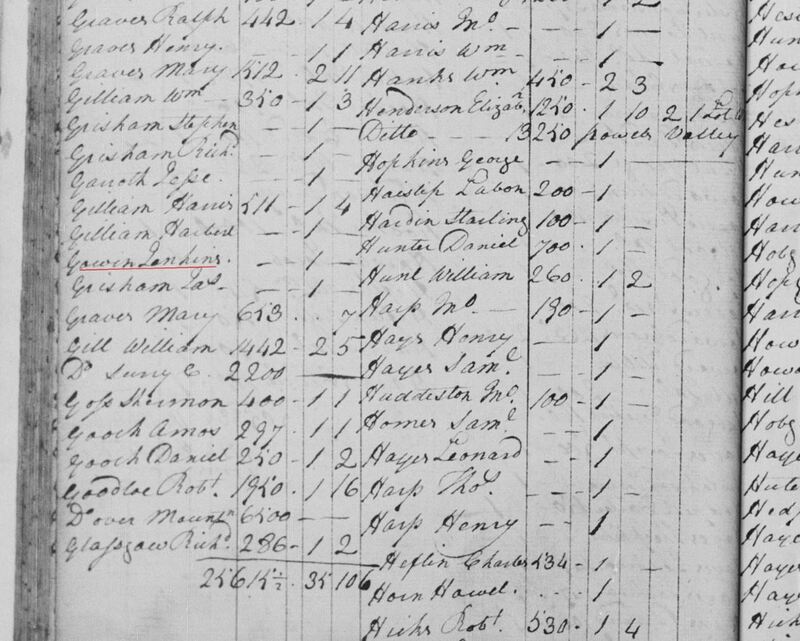 Minutes 1754-1764. pg 46 Granville Co, NC. 1760 April 21 – Title: Jonathan Barrett. Granville Co. Provenance: Class: State Records [Collection]; Group: Secretary of State Record Group; Series: Granville Proprietary Land Office: Land Entries, Warrants, and Plats of Survey; Box: Granville County, A-Be; Years: 1760, 1754; Creator: Secretary of State, Office of Granville Proprietary Land OfficeSecretary, Office of the; Call Number: S.108.270–S.108.283; Location: MFR; MARS Id: 12.12.25.41 (Folder); Genres / Forms: Land entries, Warrants, Plats, Deeds; Scope / Contents: Land Entry: 1760 April 21. 700 acres. Descriptive references for land: Island Creek, Nathaniel Henderson. Warrant: 1754 January 30. 640 acres. 1760 Dec 1 – Title: Joseph Gowing. Granville Co. Provenance: Class: State Records [Collection]; Group: Secretary of State Record Group; Series: Granville Proprietary Land Office: Granville Grants of Deed; Box: Granville Co. Years: 1760; Creator: Secretary of State, Office of Granville Proprietary Land OfficeSecretary, Office of the; Call Number: SSLG 39H; Location: MFR; MARS Id: 12.13.39.28 (Folder); Genres / Forms: Deeds, Plats, Indexes; Scope / Contents: December 1, 1760 680 acres Location: Both sides of Taylors Creek 2 copies Deed #199; Granville Co, NC. 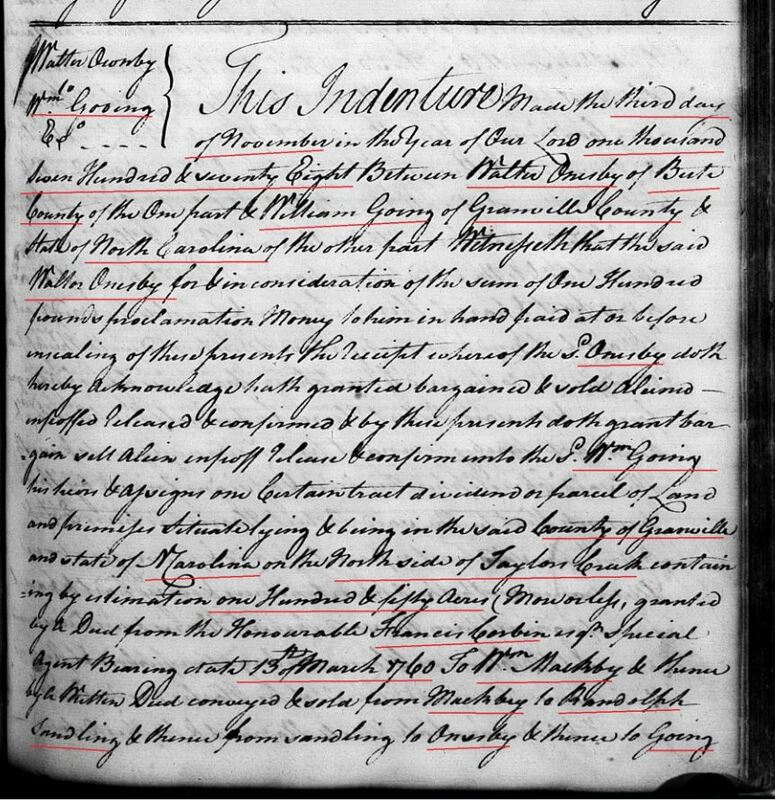 http://lumbeeindiansandgoinsfamily.blogspot.com/2007/12/granville-county-nc-early-records.html , 1760 Dec 1 – On December 1, 1760 Joseph Gowen received a patent to 680 acres “on both sides of Taylor’s Creek,” according to Granville County Deed Book E, page 143. 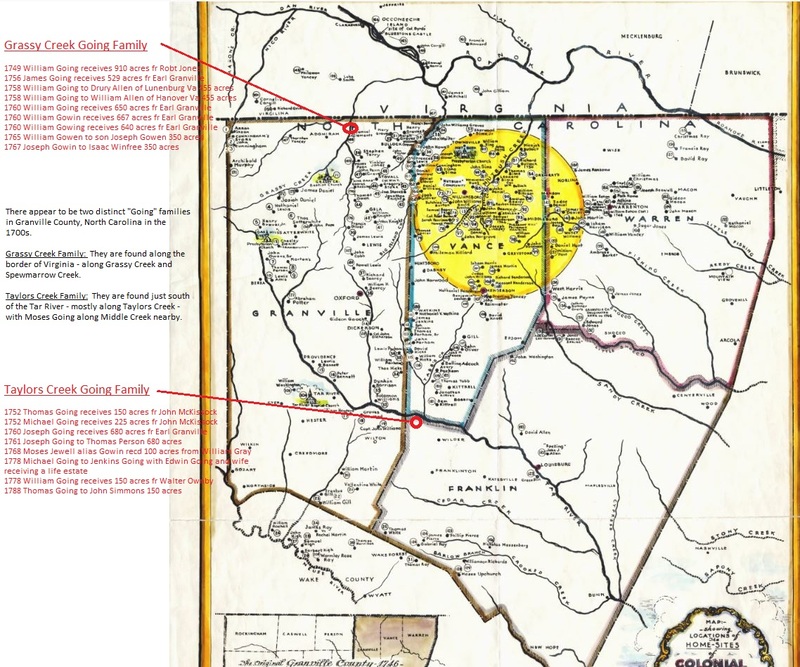 1760 Dec 1 – Joseph Gowing – Granville County, NC – 680acr on both sides of Taylors Creek beginning at a hickory. Along Newell line, Mills line, Ballinger line, Meghus line, Ford line. Granville County, NC. Creator: Secretary of State, Office of Granville Proprietary Land Office Secretary, Office of the; Call Number: SSLG 40A; Location: MFR; MARS Id: 12.13.40.2 (Folder); Genres / Forms: Deeds, Plats, Indexes; Scope / Contents: December 2, 1760 667 acres Location: Beginning at a pine 2 copies Deed #160; Granville Co, NC. 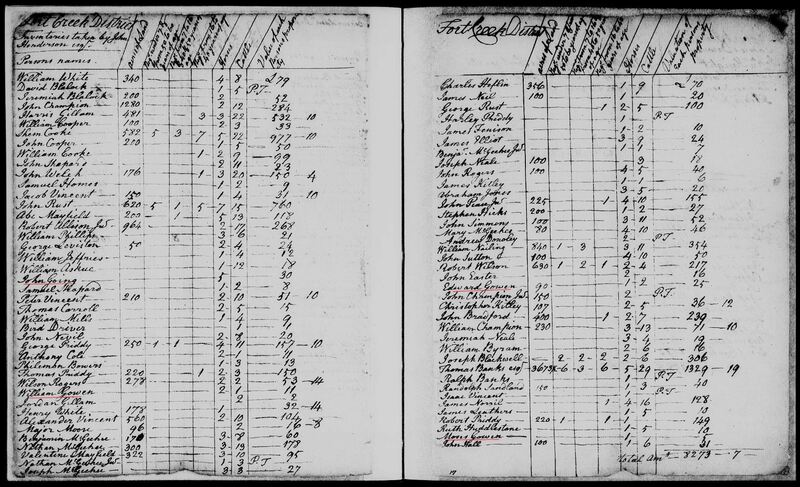 https://familysearch.org/ark:/61903/3:1:3QS7-99C5-X9G7?mode=g&i=367&cat=360398 1760 Dec 2 – William Gowen – index card no 283, 650 acres, Grant 150, Bk 11 pg 365. 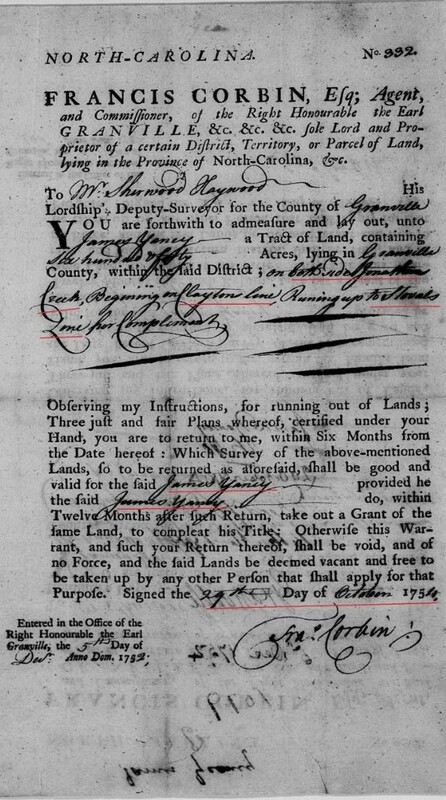 1764 Aug In the action of debt between Darwin Elwick Plt and James Gowen Deft, Richard Henderson by virtue of a power of attorney from the Deft confesses judgment to the Plt for fifteen pounds eleven shillings proc money to be discharged on payment of Seven pounds fifteen shillings and six pence like money with lawful interest thereon from the — day of — 176- till the same shall be paid. Wherefore it is considered by the Court that the Plt recover agt the Deft the said sum with costs. 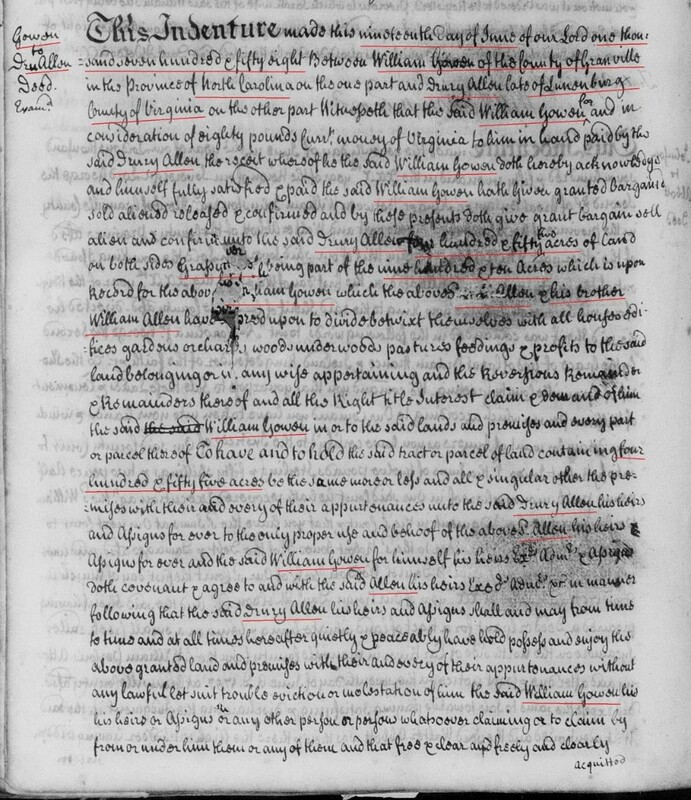 Minutes 1754-1764. pg 107 Granville Co, NC. 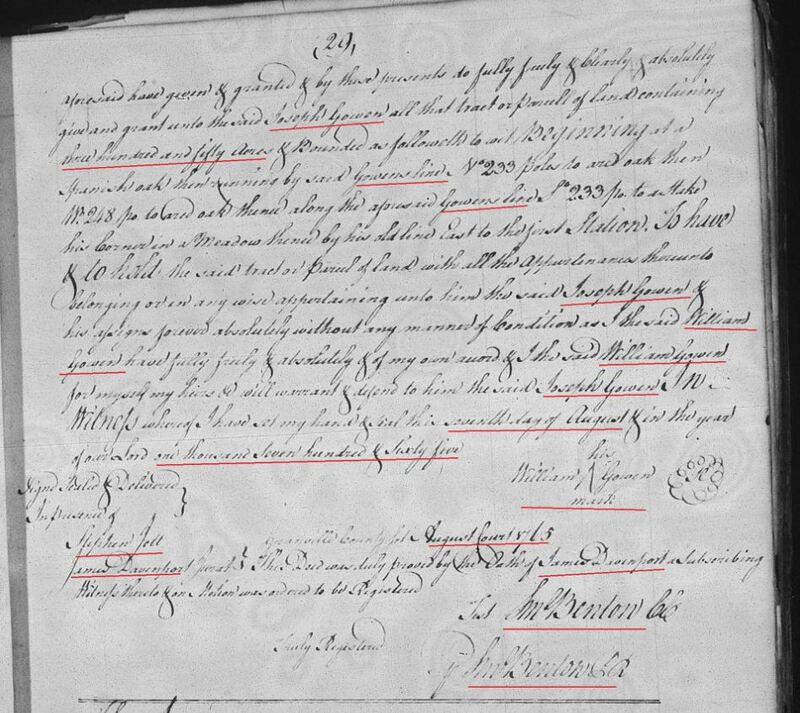 1765 Feb – In the suit on a Pet and summons between Robert Hutchings Plt and William Gowen Deft the Deft failing to appear on the Plt motion judgment is greanted him agst the Deft for three pounds fifteen shillings and ten pence procd money to be discharged on payment of like money with interest thereon from the — day of — till the same shall be paid. Wherefore it is considered by the Court that the Plt recover agst the Deft the said sum with costs. 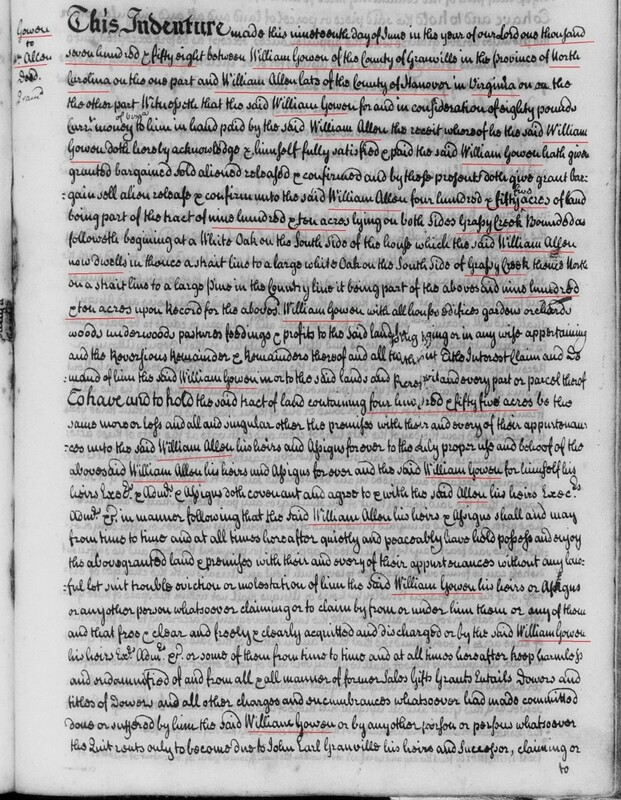 Minutes 1754-1764. pg 116 Granville Co, NC. 1767 Feb – In the action of Trespass on the case between William Hamilton and Co Plts and Edward Gowen Deft a jury being elected tried and sworn well and truly to enquire of the damages upon their oath do say that the Deft is guilty in manner and form as the Plt agst him hath declared and they do assess the Plt damages to five pounds ten shillings and seven pence prod. Money wherefore it is considered by the court that the Plt recover against the Deft the Damages aforesaid in form aforesd assessed with costs. 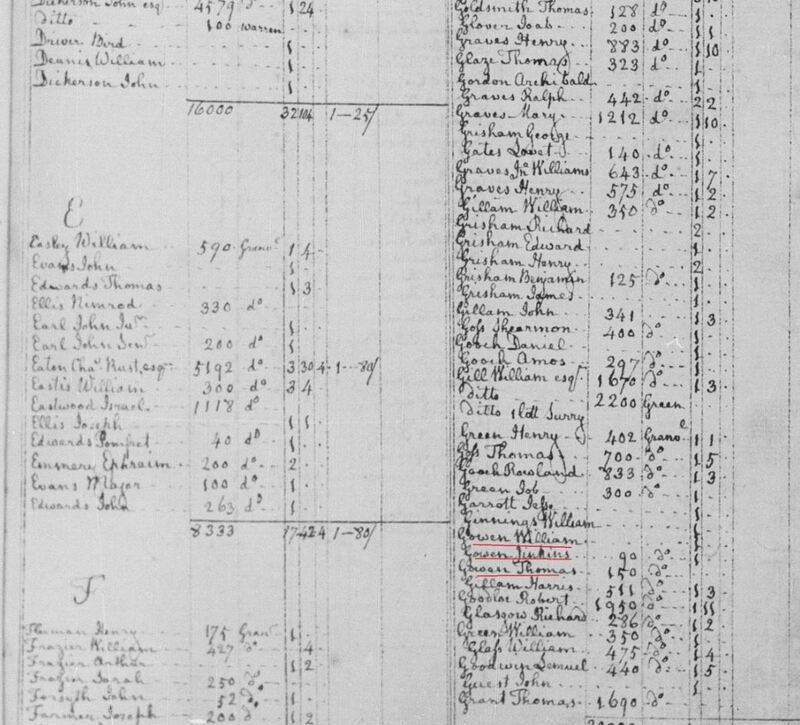 Minutes 1754-1764. pg 168 Granville Co, NC. 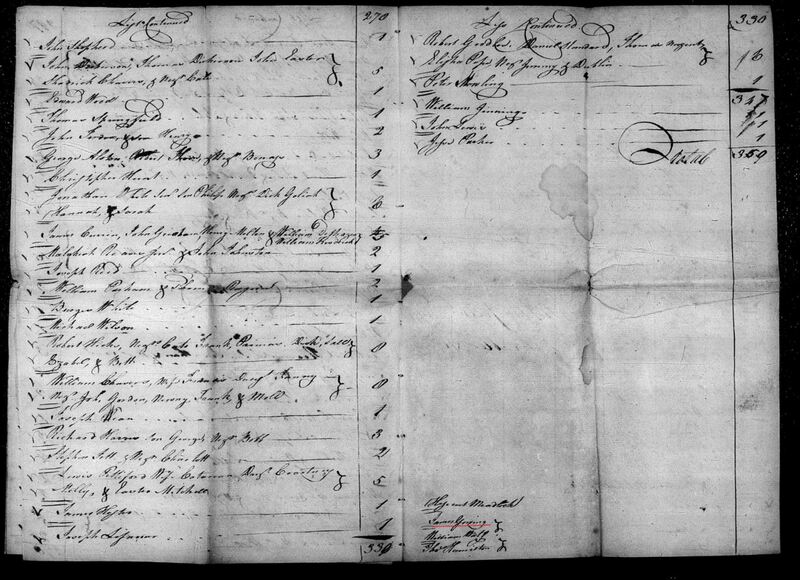 1768 – Joseph Gowen In the 1768 tax list John Pope recorded, “Joseph Gowin, his [son] Nat 2 tithes.” Granville Co, NC. 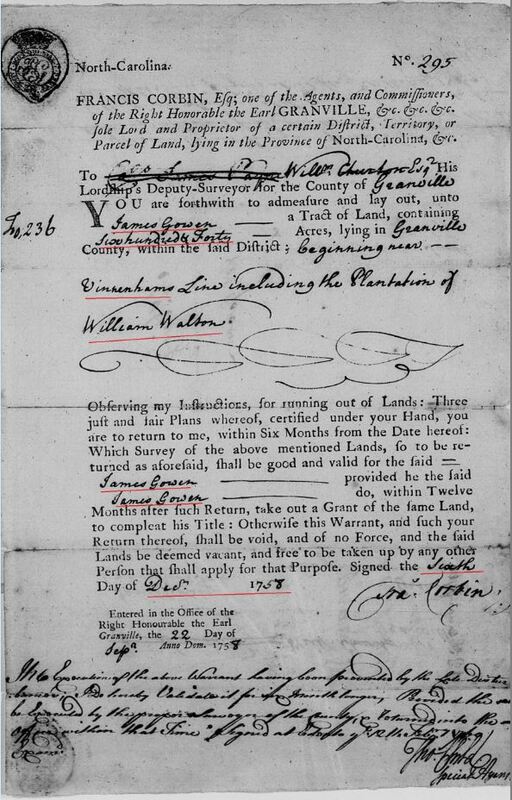 1769 – Thomas Gowen was listed as the head of a household with “three white polls” in the 1769 tax list of Granville County. Granville Co, NC. 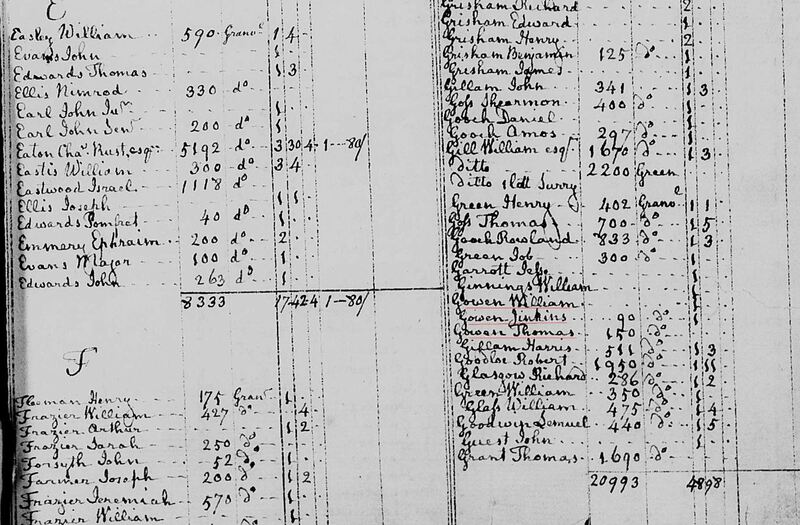 1771 -List of Granville Co Militia. 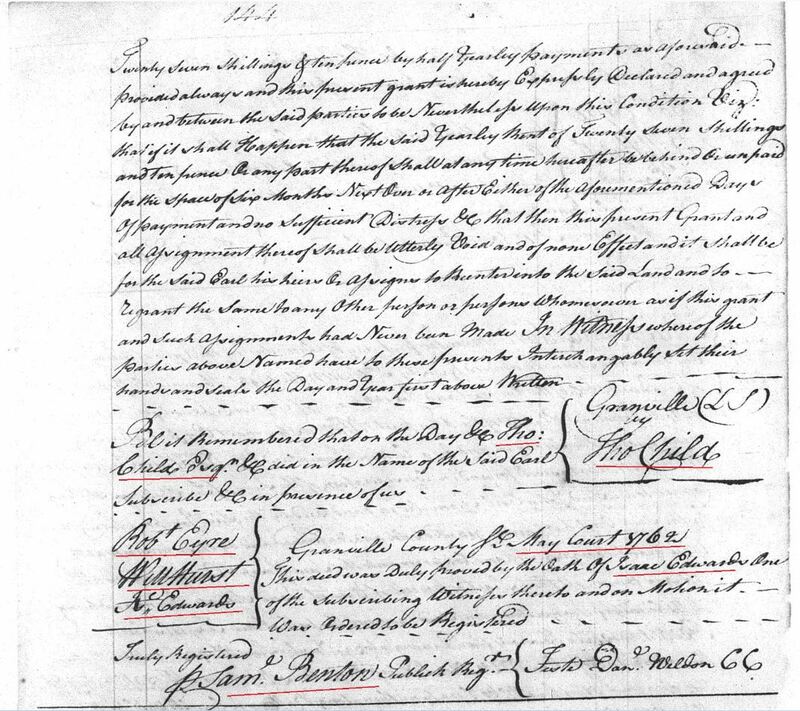 1771 – Joseph Gowen was last taxed in Granville County in 1771. Granville Co, NC. 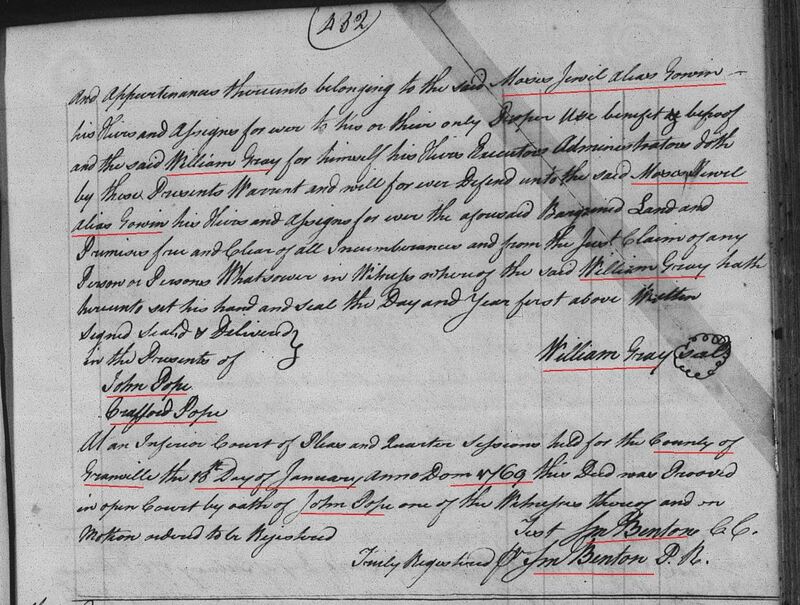 Children born to Joseph Gowen are believed to include: Nathaniel “Nat” Gowen born about 1755. Granville Co, NC. 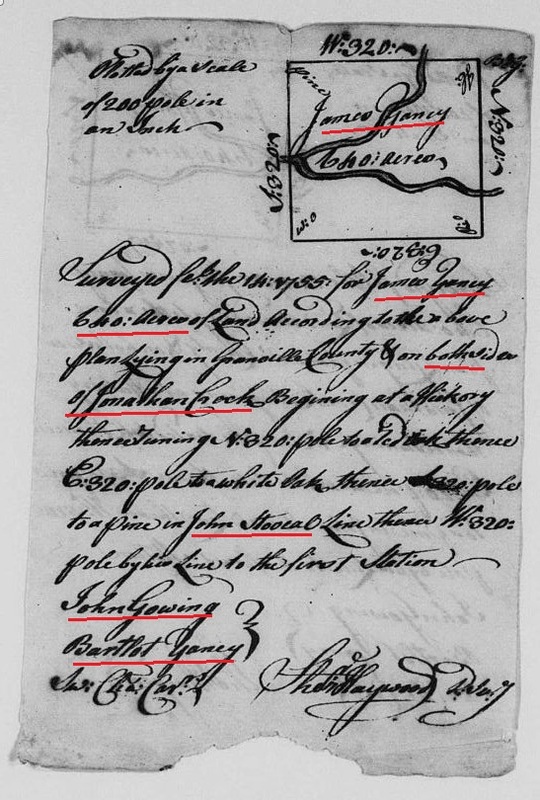 1771 – Thomas Going in the 1771 tax list he was recorded with “two white polls.” Granville Co, NC. 1773 – Nathaniel Gowen and Robert Locklear were arrested in Granville County in 1773, but were released upon paying “their prison charges” when no one appeared to press charges. Granville Co, NC. That many Inhabitants of the sd Counties who are Free Negroes & Mulattoes and persons of Probity & good Demeanor and chearfully contribute towards the Dis­charge of every Public Duty injoined them by Law. But by reason of being obliged by the sd Act of As­sembly to pay Levies for their Wives and Daughters as therein mentioned are greatly Impoverished and many of them rendered unable to support themselves and Families with the common Necessaries of Life. Historians sometime refer to mulattos in this area as Melun­geons. Colonial recorders, upon occasion, listed them as “white” and, at other times, recorded them as mulattos because of the color of their skin. The term “Melungeon” was a more recent appellation and was probably not widely used in colo­nial times. A large colony of Melungeons by the name of Gowen [and other spelling variations] existed in Melungia, the area where Virginia, Tennesseee, North Carolina and Kentucky come together. 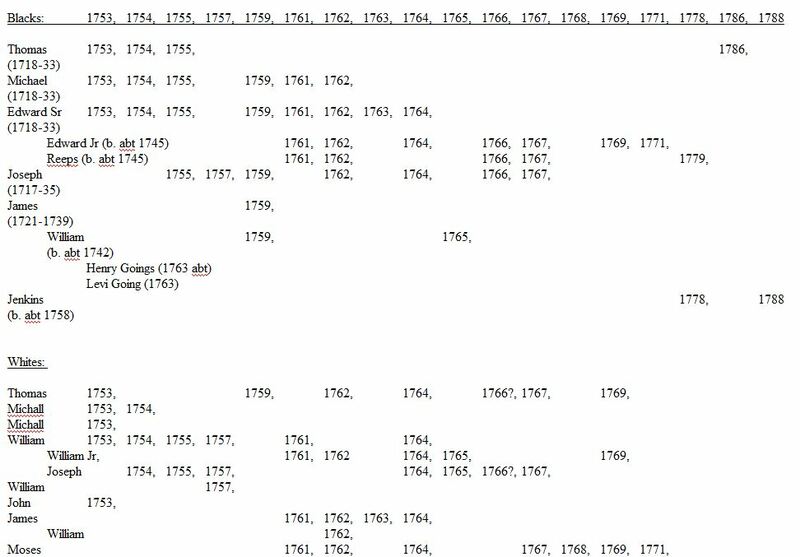 1751 [Lists do not seem to be complete, and give no racial breakdown, but do appear to tax mixed-race wives in most cases. white males, Black males, black females and “boys” ie. Black males aged 12-16. 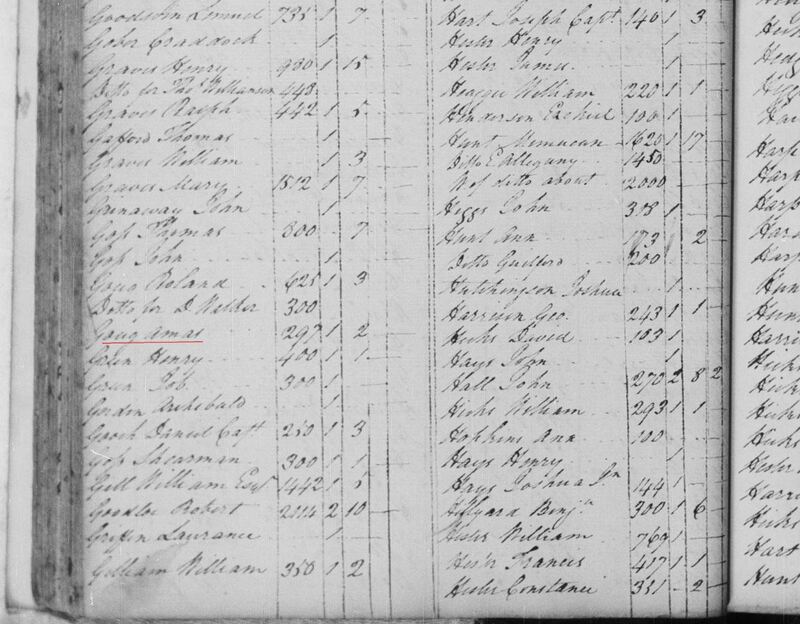 List of Samuel Benton (extant in two forms, one alphabetized. The unalphabetized list is given, but this is damaged in some places ane is supplemented from the other list, in square brackets. 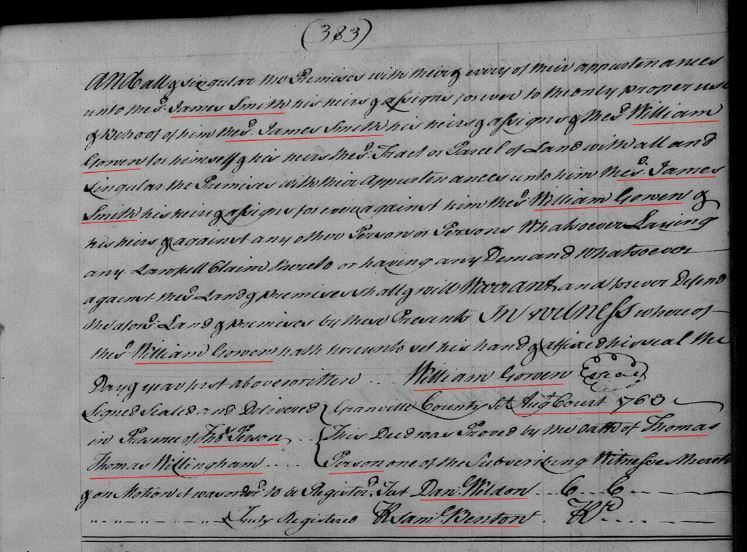 Elizabeth Goine was married to Edmund Emory February 23, 1807, according to Granville County marriage records. Bryant Cash was bondsman. 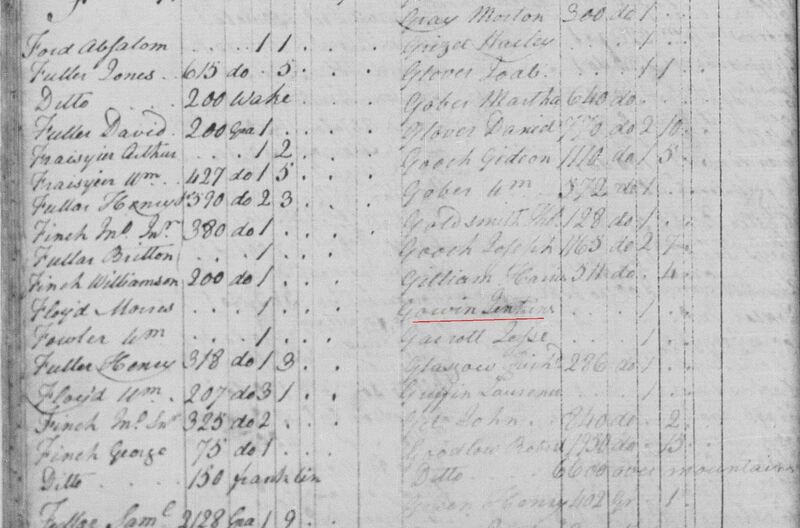 Edward Going was enumerated as the head of a household in the 1810 census of Granville County, page 143. 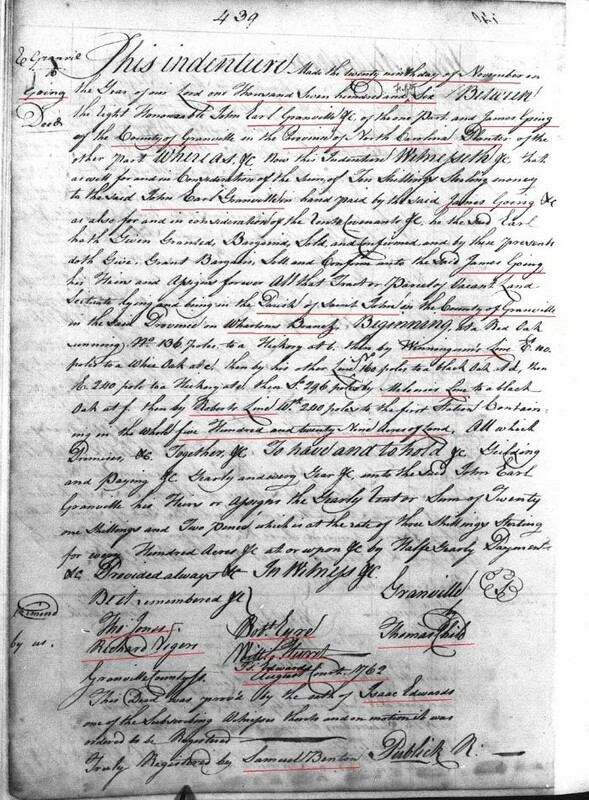 Henry Going was bondsman for the marriage of Charles Pet­tygrew and Elizabeth Cash December 6, 1810, according to “Granville County, North Carolina Marriages, 1753-1868” by Brent Holcomb. Fanny M. Sneed witnessed the ceremony. 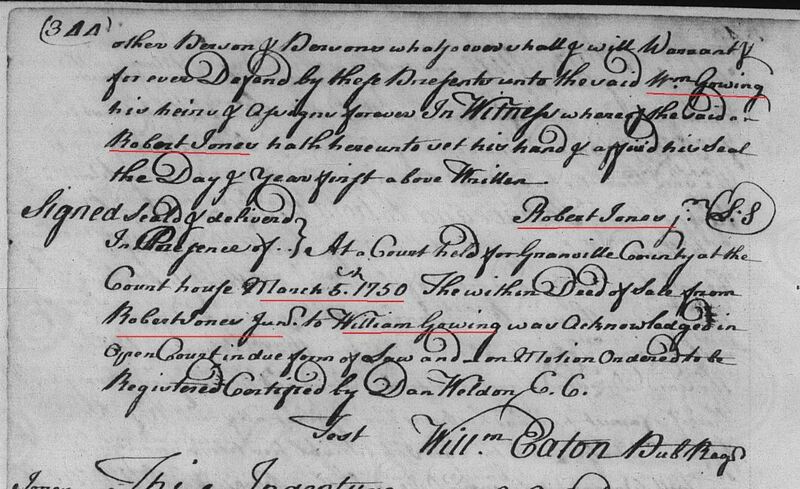 Moses Gowen was born about 1710, probably in Virginia. He later moved to Granville County, thought to be around 1750. 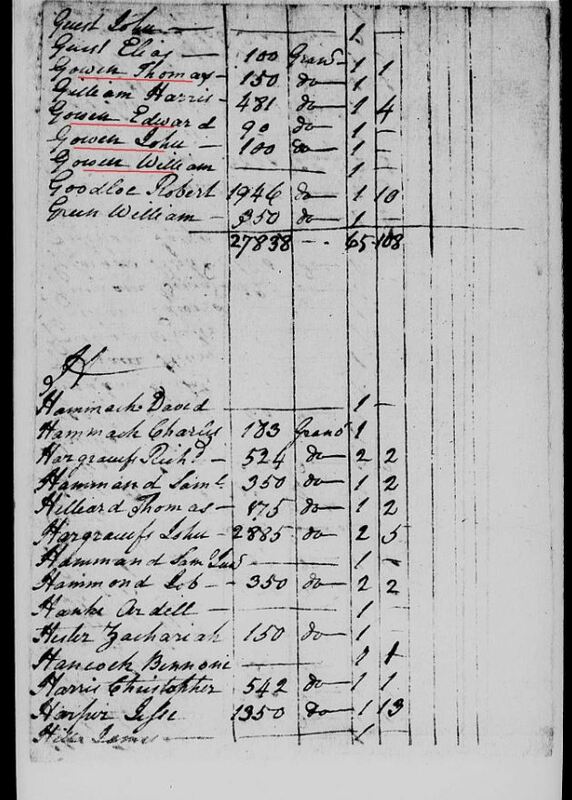 He was recorded in the 1762 tax list, page 42. 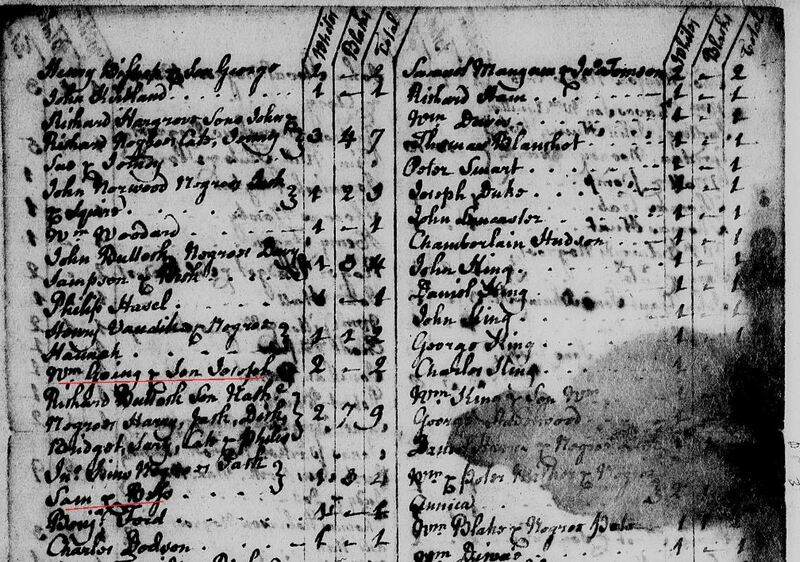 His family appeared in the Granville County tax list of 1769 with “two whites.” He reappeared as “one white poll” in the 1771 tax list. 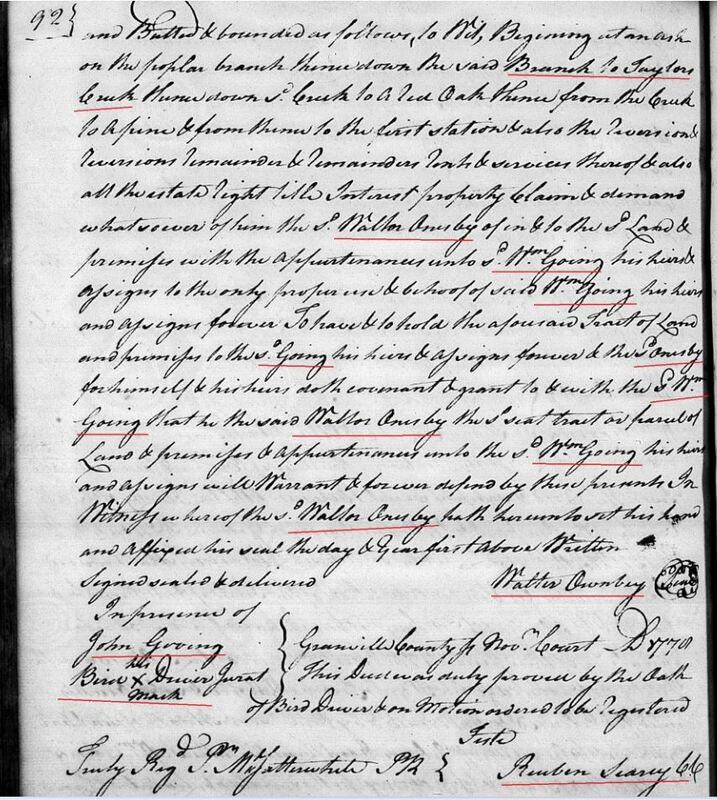 George Gowin “of Granville County” received a deed to 604 acres from Henry McCulloh “of Great Britain” August 19, 1763, according to Granville County Deed Book G, page 181. 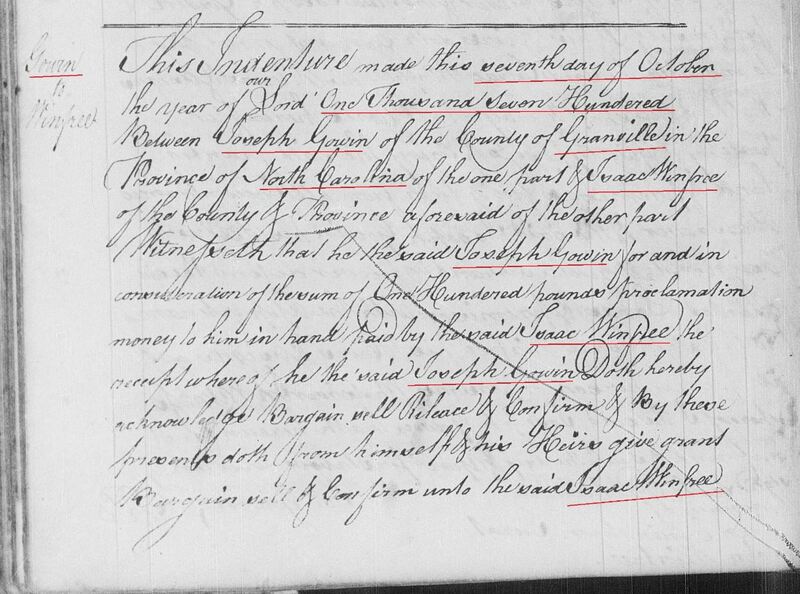 On August 1, 1762 James Gowin was “sworn chain carrier” on the survey of a patent for Ebenezer Wilson, according to Surveyor’s Book 14, page 107. 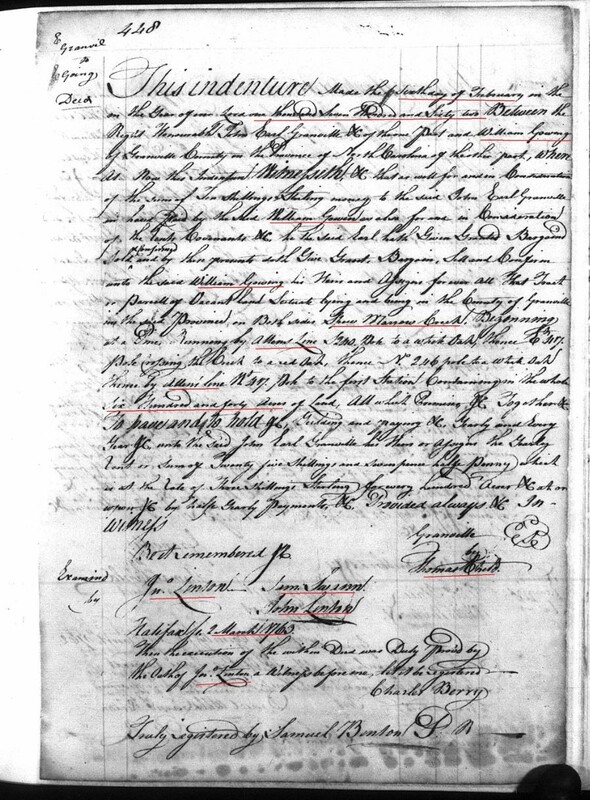 M. I. Gowin received a deed from William Gray, according to Granville County Deed Book H, page 481. 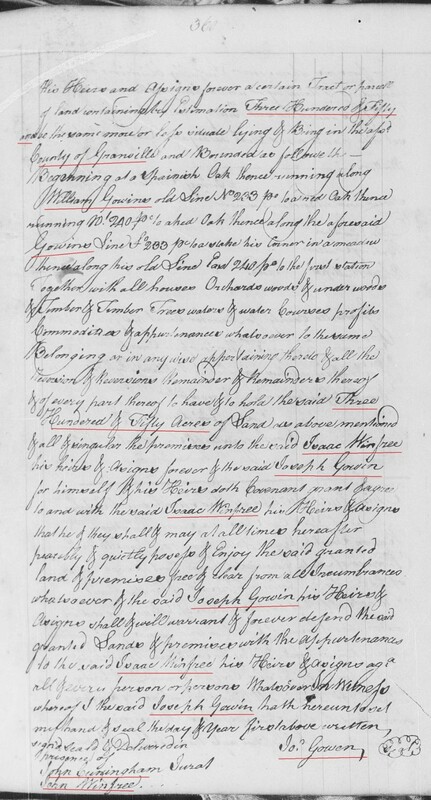 Thomas Goin was mentioned in “Drummers and Fifers in North Regiment of Militia Commanded by Col. Maurice Smith” August 15, 1815, according to Granville County Will Book 7, page 545. 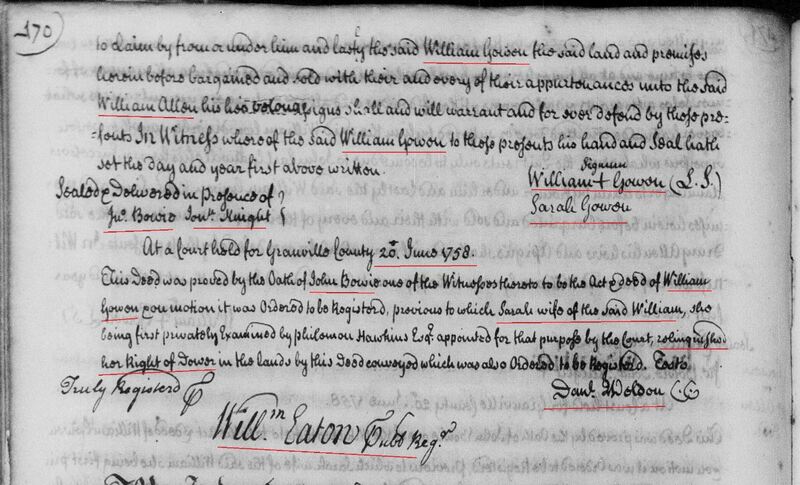 Susannah Gowan, daughter of William Gowan, was born Ap-ril 23, 1769, according to “Greenway and Related Families” by Billy L. Smith. She was married in 1793 to John Green-way, a neighbor to William Gowan in Island Creek District of Granville County. 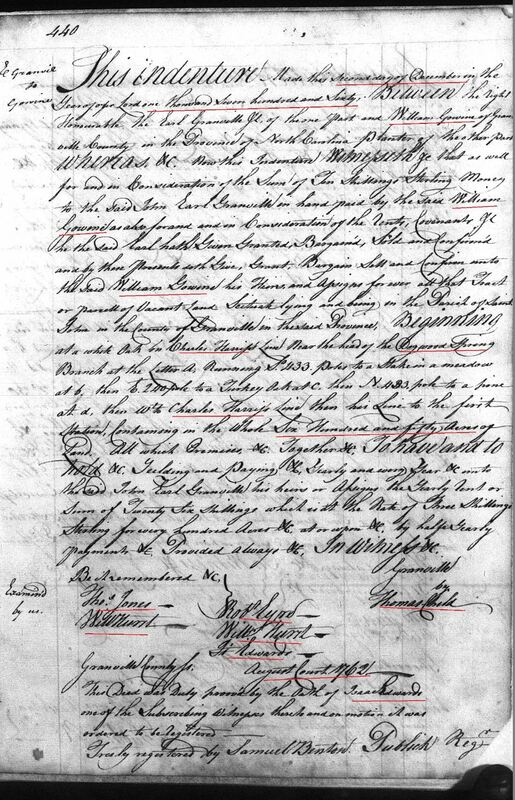 John Greenway and Susannah Gowan Greenway removed to Rutherford County, North Carolina in 1805, according to Susan Georgion, a descendant. Five chil-dren were born to them in Granville County and three more in Rutherford County. len, Robert Allen, Sr, Robert Allen, Jr, Samuel Allen, “Wid-ow” Allen, William Allen, William and Mary Allen, William Allen, Jr, Young Allen and Zachariah Allen. 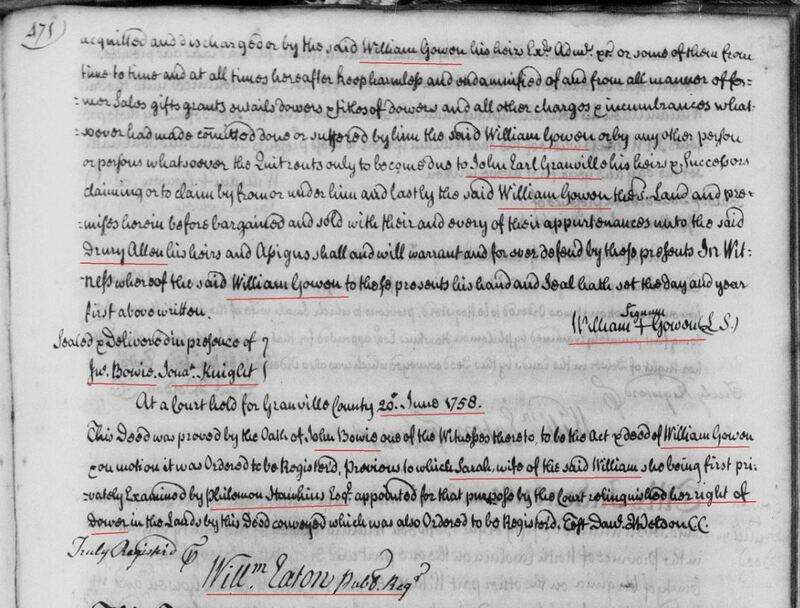 “William Allin” bequeathed property to “my second wife, Frances for her lifetime,” in his will written May 4, 1781, ac­cording to Granville County Will Book 1, page 515. 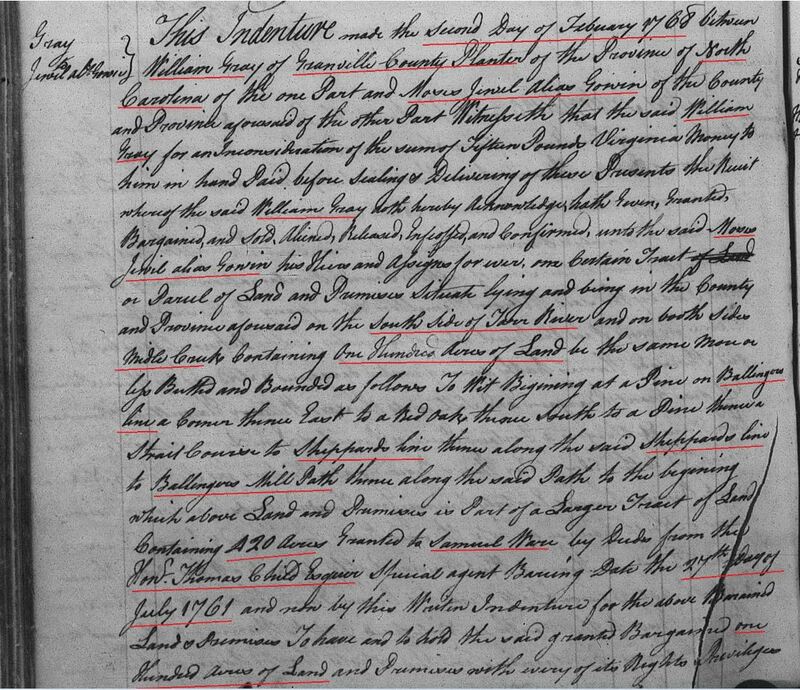 Gowin Black received a land grant of 470 acres July 28, 1761, according to Granville County Deed Book E, page 457. Goin Clayton and John Clayton were witnesses October 24, 1763 to a deed in which William Clayton conveyed 65 acres on Jonathan’s Creek to Jeremiah Clayton, according to Granville County Deed Book F, page 489. 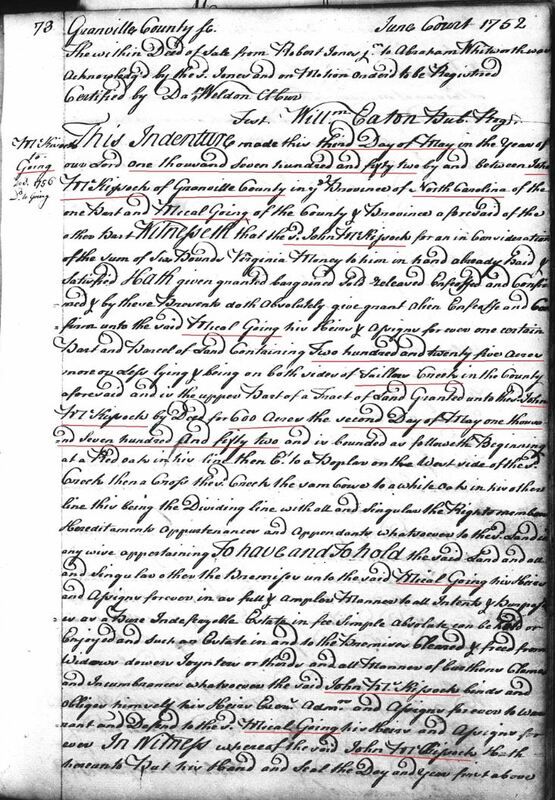 Mourning Hunt, widow of John Hunt made an agreement with William Hicks, Sr, widower whom she is about to marry, on May 30, 1778 that she will claim no part of his estate if he preceded her in death, according to Granville County Will Book I, page 514. They were married May 27, 1778 with John Searcy as bondsman, according to “Granville Pot­pourri” by Virginia Reavis Lyle. 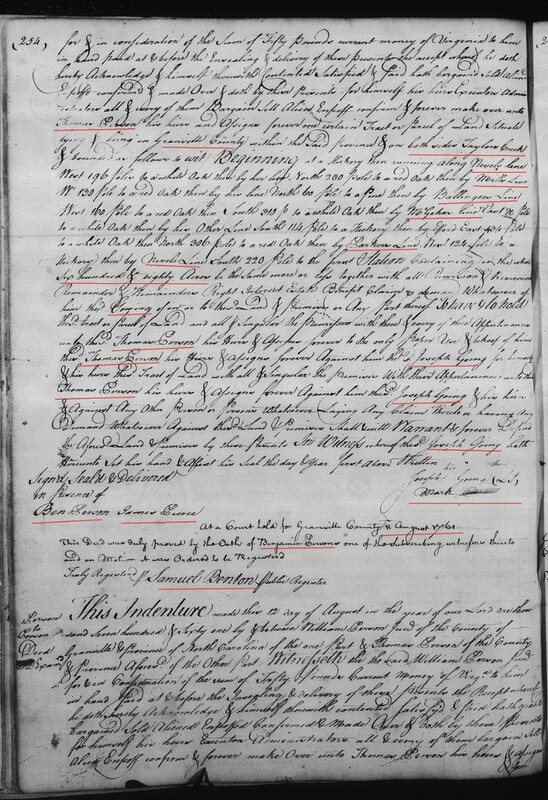 Robert Hicks received 300 acres for “100 pounds, Virginia money” March 4, 1752, according to Granville County Deed Book B, page 439.